To say this fantastic toy is magnificent would be an understatement! Taking pride of place in any child’s play space, this modern piece of composite wood furniture looks almost as if it could be a real kitchen. Containing an oven, hob, microwave, freezer, fridge and removable sink, it has everything any budding chef could ever want. Featuring plenty of bright colours, opening doors, clicking knobs and storage space for pots and pans, the Deluxe Big and Bright Kitchen really does live up to its name. Standing 109cms (3’ 6”) tall, it’s plenty big enough to allow multiple children to all play at once. KidKraft also thoughtfully provide oven gloves, a spatula and a mixing spoon for extra realism and play value. 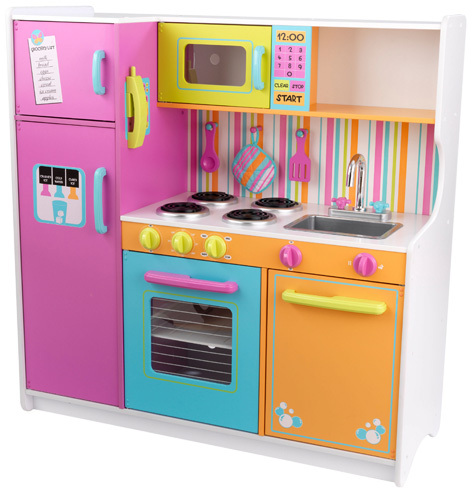 Toy kitchens and a range of exciting accessories are just part of KidKraft’s fantastic ranges of toy furniture. Check out their dollhouses, tables, chairs and wooden train sets for all members of the family. 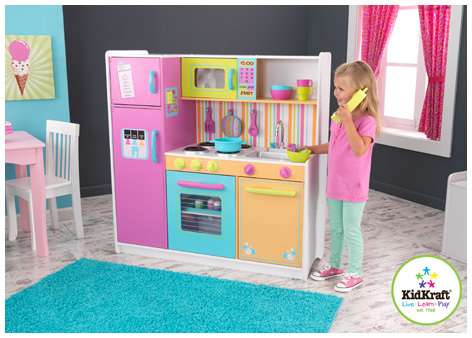 Please tell us what you think of the Deluxe Big and Bright Kitchen by KidKraft. Excellent role play kitchen, not just hours of fun but a start to learning to cook. This is every girls dream kitchen its so realistic and the bright colours makes it so appealing to the eyes. My daughter who's 3 cant get enough of it and is begging me to buy her one too. This set is lovely and keeps the kids happy for hours.